You are viewing 2005 which is posted in the miscellaneous category. 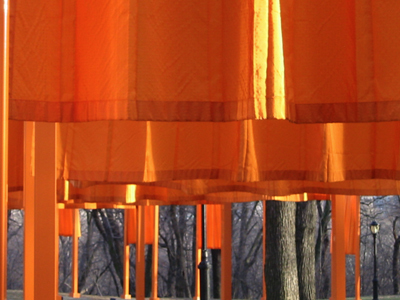 BEST DAY: 02.21.05 After working outside for a week in Central Park, I enjoyed unfurling hundreds of orange curtains for The Gates project. It was a thrill to pull the rip cord and watch heavy paper tubes bring down a gust of bright fabric. BEST SHOW: 05.11.05 Stereo Total at the Bowery Ballroom. This duo from Berlin vacillates between punk rock and hip easy listening and puts on quite a show. BEST GIFT FROM THE CITY OF NEW YORK: 06.27.05 Release from jury duty in Queens County for being a business owner without employees. Bonus: $40 check for the one day I served. BEST EXCUSE TO SPEND 10+ HOURS ON A PENSYLVANIA HIGHWAY: 07.08.05 Beermageddon. BEST EXCUSE TO DRINK WINE AT NOON: 08.28.05 Hosting a brunch wine tasting was a new and pleasurable experience. Long live rosé! BEST MEAL: 09.06.05 Fish tacos at The Oar on Block Island. More about the location than the food. Think 80 degrees, a light breeze, bright sun and a harbor full of sailboats. BEST BOOK: 09.16.05 I really enjoyed An Invisible Sign of My Own by Aimee Bender. An original and quirky story woven around the mysterious nature of numbers. BEST GALLERY SHOW: 10.22.05 Sonnabend exhibited two pieces by Candace Breitz that were riveting. One called King (A Portrait of Michael Jackson) and another called Queen (A Portrait of Madonna). Each piece is a multi-channel video installation that shows fans of the pop stars performing to songs by their idols. Maybe not the best art I saw in 2005, but the most memorable. BEST NETFLIX RENTAL: 12.13.05 Italian for Beginners. The home video-like production of this funny Danish film makes you feel like you've discovered a jewel in the 99 cent bin at Blockbuster. Best wishes to all Gutsy readers in 2006! Wow! You had never eaten at a Cracker Barrel prior to 2005? Growing up in SC, Cracker Barrel goes way back for me. Did you enjoy browsing in the gift shop and rocking in the chairs outside? Is there a midwest equivalent of Cracker Barrel? It was truly my first time at Cracker Barrel. My dining companions (all who have lived in SC) were as surprised as you are. Browsing the gift shop was overwhelming! There was a stuffed parrot that you could "teach" to say different words (actually a recording device). And Mr. Parrot was apparently not offended by dirty words. As far as I know there is not a CB equivalent in the midwest. They have Perkins, which has home-style food and a "wishing well" with cheap toys for the kids, but it doesn't hold a candle to CB. having been a part of the parrot parody incident, i was rather taken aback by just how funny it was to get the bird to say cuss words. in my mind that stuffed bird is still muttering "motherf***er" to all who enter the gift shop. good clean fun. Just to let you all know, yes, we do have Cracker Barrels in Minnesota however they are way out in the boonies to attract the exburb crowd. I don't think they really came on the scene until the 1990's here. I have been to one, for a mandatory staff breakfast. I cursed the whole way there because I couldn't find the damn place!